Cayenne peppers belong to the nightshade family, which includes tomatoes, jalapenos and bell peppers. Cayenne contains many properties of an herb but technically is a fruit. It has several health benefits attributed to cayenne’s active ingredient, oleoresin capsaicin. 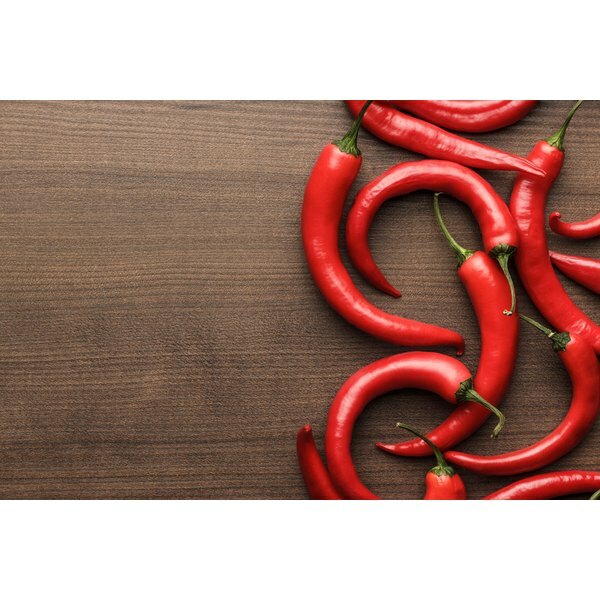 This substance provides the heat commonly associated with cayenne. Oleoresin capsaicin affects your body by releasing a neurotransmitter called substance-p into your bloodstream. Using a cayenne tincture may increase the medicinal benefits of capsaicin. Before using any cayenne tincture supplement, speak with a medical professional. Tinctures are liquid solutions that contain concentrated levels of a substance. The manufacturing process for tinctures typically uses rectified spirits or alcohol to as a base for the concentrated levels of the substance. The alcohol used in tinctures is not rubbing alcohol but a 90-proof spirit, such as vodka, gin or brandy. The alcohol dissolves the main chemicals of the substance, preserving them for future use. Using spirits to produce tinctures is beneficial because you can consume spirits; other types of tinctures that are made without alcohol can be applied only topically. According to the book “The Healing Power of Cayenne Pepper: Complete Handbook of Cayenne Home Remedies,” cayenne provides several health benefits. However, the strength of those benefits depends mainly on the Scoville rating, or heat, of the cayenne pepper. Cayenne is purported to lower blood pressure, increase heart performance and improve circulation; it is also believed to prevent blood clots and act as a mild pain reliever and a diaphoretic to induce sweat. The benefits of cayenne pepper relate directly to the specific cayenne pepper’s Scoville rating, which gauges the heat level of peppers. According to “The Healing Power of Cayenne Pepper: Complete Handbook of Cayenne Home Remedies,” cayenne peppers usually measure between 30,000 and 50,000 Scoville units, although some varieties can exceed 100,000 units. When purchasing cayenne tinctures, ensure that the tincture measures at least 20,000 Scoville units. This is the minimum level at which you will start to experience cayenne’s benefits. Unless you make the tincture, you cannot accurately gauge the tincture’s possible medicinal effects. Take precautions when using a cayenne tincture, because the manufacturing process makes the cayenne more concentrated. Cayenne tincture manufacturers typically recommend consuming five to 30 drops of the tincture, three times per day. Cayenne pepper tinctures can increase the absorption of some medications, making their effects much stronger. Never use a cayenne tincture when taking ACE inhibitors or antacids. Speak with a medical professional prior to consuming any cayenne tincture.